Wakari School's burgeoning roll has forced it to establish an enrolment zone to prevent overcrowding. The Ministry of Education instructed the year 1-6 school to implement the zone after its roll reached about 360 pupils last year. An enrolment scheme is a means of limiting the roll to prevent overcrowding at one school, and enables the ministry to make best use of the present facilities at other schools in the surrounding area. As part of the process, the school's board of trustees is consulting the school community, the wider community and neighbouring schools. Principal Chris Smith said the introduction of the enrolment zone would not affect children who were enrolled at the school at present. "For children who have not yet enrolled, the enrolment scheme means if they live in the zone of the school, they will have the right to enrol at the school. "If the board of trustees enforces the enrolment scheme, then if they live outside the zone, they will only be able to enrol at the school if there are places available in their year group." If more children wished to enrol than there were places available, places would be offered in accordance with the Education Act, he said. The Act shows priority must be given to pupils accepted for enrolment in a special programme run by the school. If there are more applicants than there are places available, selection would be by ballot. 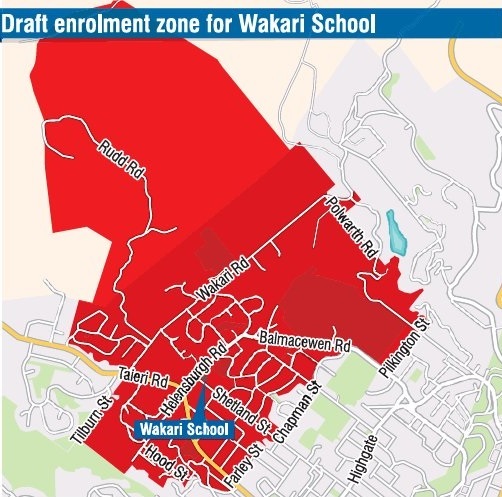 Mr Smith hoped the enrolment zone would have "little-to-no-effect" on children wanting to enrol at Wakari in the future." But before making any decisions on the enrolment scheme, the board wanted to hear the views of the community. "We appreciate that this process will cause uncertainty for some families, and we will keep the school community updated." Submission on the zone would close at 4pm next Wednesday.